It’s a Tuesday morning in October, and the honeymoon phase of the beginning of the year has worn off. After being greeted with a high five at the door, students walk into a room full of energy, with Beyoncé’s “Crazy in Love” blaring on the speakers. Projected on the whiteboard is a Fox News article claiming that Beyoncé didn’t write the lyrics for the song. By the end of the lesson, students will discover how they can use statistical reasoning to investigate this claim. This lesson serves as a representative sample of my teaching philosophy – one where students are inspired and empowered to take responsibility for their own learning by actively constructing their knowledge through discussion with their peers. As students find their seats, I overhear a group talking. “Beyoncé was my first concert. She is so talented.” A short conversation starts and the group is now curious about the article posted at the front of the room. They are wondering how it’s possible that Beyoncé is connected to statistics. I give them a few minutes to discuss in groups. At this point in the year, students have had extensive practice with productive group work. Students feel safe to share ideas in their groups and explain their thinking to their peers. 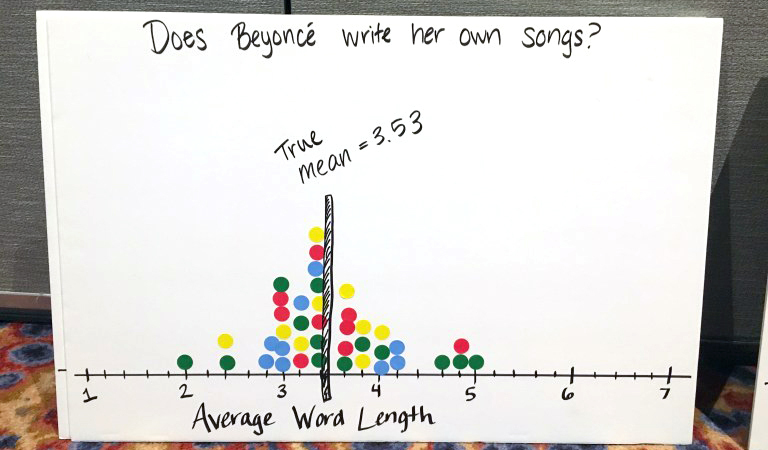 We come back to a whole group discussion, and eventually the conversation takes the direction I had hoped: We can find the average word length for the song “Crazy in Love” and compare it to average word lengths for other Beyoncé songs. At this point, the students start working in their groups. They collect data and begin discussing with their peers to make sense of their results. I support the learning in each group by walking around the room and providing specific questions, cues or prompts needed for groups to nudge their thinking forward. Each group writes their estimated average word length on a sticker dot and brings it to a poster at the front of the room. By the end of the activity, students have created several colorful dot plots that will serve as a visual representation of the experience. Next, we enter the debrief stage of the lesson, where I will help students to formalize their learning. Here, I help individuals connect their experience and thinking from the activity with more formal definitions and formulas. Students connect the context of the activity with the statistical concepts of convenience sample, simple random sample, bias and sampling distributions. Any time later in the course when these definitions are needed, students can remember back to the story of the Beyoncé activity. Context is the connection in the brain that allows new information to be stored in long-term understanding. This “Experience First, Formalize Later” approach to learning is quintessential to my teaching philosophy because it engages students in multiple dimensions. First, the experience is always based on a story – investigating Beyoncé lyrics or Stephen Curry’s three-point shooting. By using contexts that are relevant to students, curiosity is sparked and engagement increases exponentially. Second, the experiences can be easily designed so that knowledge is accessible for learners of all levels. The experiences are more often about thinking and reasoning, rather than application of specific pre-requisite knowledge. This allows all students entry points into the learning. Third, this approach requires students to collaborate and communicate their ideas. Rather than a one-size-fits-all lecture, each individual can take their own path to understanding. The posters will be proudly displayed in the classroom for the remainder of the school year – a reminder that students construct the knowledge. After a year of experiencing lessons similar to this one, each person leaves my classroom with a new concept of what it means to be a learner. I believe learning is not a passive process of taking notes and memorizing formulas and definitions. Learning requires active engagement in constructing one’s own understanding. Once students recognize they are ultimately responsible for taking control of their education, they will have internalized a commitment to lifelong learning.